A post with an imposing title, you say. 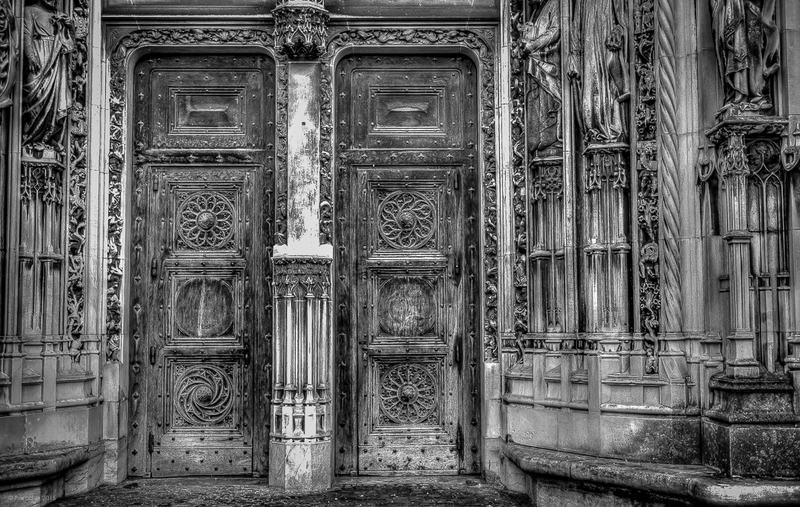 I say it’s appropriate for this imposing set of doors which are the focal point of an entryway named after the 16th century bishop of Lausanne, Sébastien di Montfalcon. This was one of the first images captured while on a recent visit to that city. I had just woken from a short nap, prescribed by my son-in-law as a way to overcome the effects of jet lag, and was out for a walk. My companions and I made our way to the Cathedral of Notre Dame for a view of the city. I must admit that I was not altogether with it but when these magnificent doors came in to view I knew I had to stop. While searching the web the other day I was surprised to find a site which displayed photos of some of the stone carvings which you can see surrounding the entrance. They represent figures from the bible, various saints, bishops, and creatures both real (including my favorite, snails) and fanciful. I am sorry that this was the only view of the portal that I captured. After I took this shot, I lifted my gaze from the camera to notice that my party was nowhere to be seen. I moved on and do not blame them for it was I who chose not to take the time to focus on the photographic treasure before me. I should have remained. I’ve done this before, short-changed the creative process. I don’t know why I rush. I don’t know why I don’t stop to concentrate. I too often find myself doing the photographic equivalent of eat-n-run. Why can’t I learn to savor my subjects? What’s my hurry? Where am I rushing off to? I did this the other day at Ravensburg State Park. Looking back at the photo posted from that day’s visit, it’s clear that my vantage should have been just a bit lower to the surface of the water. As it is, there is too much of an angle between my line of sight and the surface of the water. This bothers me for these lines should have been parallel. To be honest, I believe I was aware of this shortcoming as I shut the camera off and tucked the tripod under my arm. Chalk it up to inexperience and my personality. I need to learn to relax, slow down, take a breath, maybe two, and enjoy what I’m doing. I will try.